Rich Patton (affectionately known as “The Blue Crooner”) sings and plays guitar. He also doubles on blues harmonica and tenor saxophone. Rich is a recently retired educator but playing and performing music is his passion. 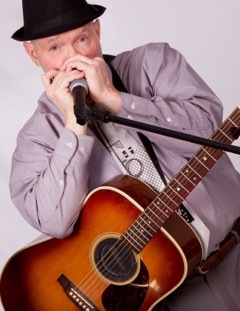 Rich loves to play the blues, R&B, baby-boomer favorites, country, old rock n’ roll, jazz, classic favorites, recent hits, slide guitar and special songs improvised for people in the audience. Tell him about birthdays as the standard “Happy Birthday” will be followed by an improvised, unique “birthday song”. Rich is great with audiences and connects quickly with people of all ages. His act is lively and fun. He is dependable, accommodating and will work well with clients and staff. He performs for a wide range of venues including nightclubs, wineries, breweries, festivals, children events, schools, retirement centers and much more. He has performed in several different states and countries.